The AWA HealthGuard membership includes valuable discounts and special offers on a variety of consumer, business and health care programs and services. It also provides Accident and Sickness Limited Benefit insurance and Group Accidental Death and Dismemberment Insurance to help with out-of-pocket medical expenses. Additionally, the AWA HealthGuard Max membership includes Term Life insurance. These memberships are offered year-round with a choice of four plan levels to best fit your needs. The MultiPlan Limited Benefit Plan Network is a Preferred Provider Organization (PPO). A PPO is a network of health care providers who agree to provide services at a pre-negotiated rate. The MultiPlan Network is an important feature of your AWA Plan. You have access to thousands of hospitals, practitioners and ancillary facilities who have agreed to significant discounts on their medical services. The MultiPlan Network includes nearly 4,400 hospitals, 79,000 ancillary care facilities and more than 700,000 healthcare professionals nationwide. With discounts averaging 42% for physicians and specialists—the types of services most typically used with these plans—AWA members get more value for their benefit dollars. Pays a daily benefit if a Covered Person incurs charges for and is Confined in a Hospital for a period of no less than 20 continuous hours due to injuries received in a Covered Accident or due to a Covered Sickness. This benefit is not payable for emergency room or outpatient treatment. Pays a benefit for the first day of hospitalization if a Covered Person incurs charges for and is Confined in a Hospital for a period of no less than 20 continuous hours due to injuries received in a Covered Accident or due to a Covered Sickness. This benefit is not payable for emergency room treatment. Pays a benefit for any day a Covered Person undergoes a surgical procedure due to a Covered Accident or Covered Sickness. The procedure must be performed by a board certified surgeon in a Hospital or an Ambulatory Surgical Center. Anesthesia must be administered by a licensed anesthesiologist or certified registered nurse anesthetist (CRNA). Pays a daily benefit for any day a Covered Person incurs charges for a surgical procedure performed in an Ambulatory Surgical Center or in a Hospital on an outpatient basis. The charges must be incurred as a result of injuries received in a Covered Accident or due to a Covered Sickness. Pays a daily benefit for any day a Covered Person incurs charges for and requires a Doctor's office visit due to injuries received in a Covered Accident or due to a Covered Sickness. Visits due to injuries received in a Covered Accident must occur within 72 hours after the date of the Covered Accident. Services must be rendered by a licensed Physician acting within the scope of their license. Pays a daily benefit for any day a Covered Person incurs charges for diagnostic x-ray and/or laboratory testing caused by a Covered Accident or Covered Sickness. The test must be ordered by a Physician because of a Covered Accident or Covered Sickness and must be performed in a Hospital, Ambulatory Surgical Center, Doctor's office or Diagnostic Center or Facility. This benefit is not payable if Hospital Confinement, Emergency Room or Doctor Office benefit is paid. Pays a daily benefit for any day a Covered Person incurs charges for and requires medical care from an emergency room due to injuries received in a Covered Accident or due to a Covered Sickness. Services must be rendered by a Physician. Visits due to injuries received in a Covered Accident must occur within 72 hours after the date of the Covered Accident. Benefit will not be payable if Covered Person is confined in a Hospital as a result of the injuries received in the Covered Accident or due to the Covered Sickness that caused the visit to the Emergency Room. Pays a benefit for any day a licensed professional ambulance company transports a Covered Person by ground transportation to or from a Hospital or between medical facilities, where treatment is received as the result of a Covered Sickness or Accident. The ambulance transportation must be within 90 days after a Covered Sickness or Accident. Benefit is payable once per Covered Sickness or Accident. There is a 30-day waiting period for sickness on the Accident and Sickness Limited Benefit Health Insurance. Not applicable for residents of California, Idaho and Texas. 1The Hospital Intensive Care Unit Benefit is not paid in addition to the Hospital Confinement Benefit in CA; only one benefit is paid. 2Maximum Days per Insured per Membership year for CA residents is 5. 3The Surgery Benefit pays a flat dollar amount, based on the Surgical Fee Schedule, in ID, NE, OH, and TN. The benefits per membership level are as follows: Level 1- N/A, Level 2, 3 and 4 – up to $850. Anesthesia remains 25% of surgery benefit in these states. CA surgery benefits Level 1 – N/A, Level 2 – 90% of 2010 RBRVS fee with $5,000 maximum benefit per coverage year per covered person, Level 3 and Level 4 – 100% of 2010 RBRVS fee with $10,000 maximum benefit per coverage year per covered person. Anesthesia remains 25% of surgery benefits for California. 4The Outpatient Surgical Facility Benefit is not available in CA. 5Maximum Days per Insured per Membership Year for CA residents on Level 1 is 3. 6The Emergency Room benefit is paid in addition to the Hospital Confinement benefit for residents of CA only. This benefit also includes Urgent Care for residents of CA only. Pays up to benefit amount shown, after deductible, for excess medical expenses, if a Covered Person is injured as the result of a Covered Accident and receives the first treatment or service within 90 days of the Covered Accident. Pays benefit amount shown if a Covered Person is injured as the result of a Covered Accident, and dies, or loss occurs, within 365 days after the Covered Accident. Only one amount, the largest benefit amount to which the Covered Person is entitled, will be paid for all losses resulting from one Accident. If the Primary Insured's death or dismemberment occurs while riding as a fare-paying passenger in a Common Carrier, the Common Carrier Benefit will be payable. There is no Common Carrier Benefit for dependents. 7This benefit pays in excess of any other valid coverage, health plan, automobile medical payments coverage, government provided coverage, Workers Compensation coverage or any other employer/employee liability coverage, regardless of any coordination of benefit provision contained in the aforementioned coverages. 8Covered Spouse and Covered Dependent children receive a percentage of the Primary Insured’s Principal Sum, as listed in the table above. *There is an administrative charge of $75 to process the Accelerated Benefit claim. *One-time $99 enrollment fee applies. Rates include a $19.95 monthly administration fee. 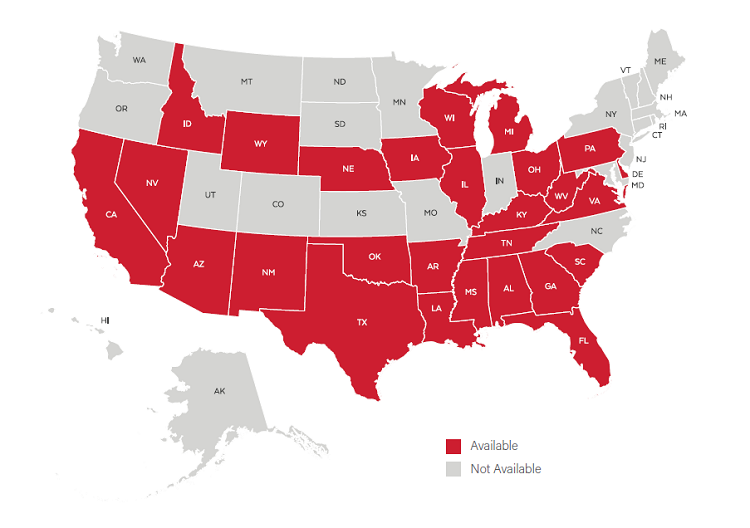 Reside in an available state: HealthGuard Group Accident and Sickness Limited Benefit Insurance is underwritten by Unified Life Insurance Company and available in the following states: AL, AZ, AR, CA, DE, FL, GA, ID, IL, IA, KY, LA, MI, MS, NE, NV, NM, OH, OK, PA, SC, TN, TX, VA, WV, WI, WY. Not enrolled in Medicare, Medicaid, Medical Disability or any other Federal or state-funded program. Not Available in AK, CO, CT, DC, HI, IN, KS, ME, MD, MA, MN, MO, MT, NH, NJ, NY, NC, ND, OR, RI, SD, UT, VT, WA.